A Fox report today suggests Iranian Pastor Youcef Nadarkhani, sentenced to death for apostasy from Islam, is still alive, for now. Significantly, the report suggests pressure as a result of an outcry from the West is causing the Iranian authorities to reconsider their decision. Why not retweet every reference to this issue we come across to bring it right up the agenda? I've posted a couple of links and appeals on Twitter@Smith_Calvin. I also noticed Nicky Gumbel (Alpha) had called for a mass Twitter response today. I'm sure others are doing likewise. Letters to the Iranian embassy are important, but the more this goes viral (as it has been doing for some days) the more people talk about it, and importantly, Iran knows it's being talked about. In the church I spoke at yesterday they showed this Alpha video which went viral. Now I know it's really quite old now, and I'm showing I don't really keep up with these things, but it's actually the first time I've seen it and I thought it was great. My in-laws were not too impressed with the censorship bit, but I thought the video was pretty slick, especially the end where it all comes to rather swift and depressing end. A classic example of good advertising that makes you think. Over the years Alpha has been both praised and criticised. Critics feel it is overly pneumacentric (Spirit-centred) at the expense of a clear focus on Christ (Christocentric). I've heard several proponents respond by pointing out how, as originally an Anglican initiative, the course originally sought to take unchurched Anglicans who think considered themselves Christians already (i.e. baptised as children, confirmed, married in church, not in regular attendance yet still considering themselves Christian) to show how Christian faith requires more than this, that it must be lived out through the indwelling of the Holy Spirit. Others criticise its links with Holy Trinity Brompton, where the Toronto Blessing phenomenon was apparently evident under then-vicar Sandy Miller. Others point to the fruit of the course, with many new people coming to Christ and finding a church. What do you think? Are these criticisms justified or not? Does that Anglican unchurched argument adequately explain its pneumacentric aspect, or indeed is it more Christocentric than some critics believe? And to what extent is it reasonable for Alpha to be judged on what happened at HTB years ago? I visited the church some years ago, since Nickie Gumbel took over, and my distinct impression was how completely un-Charismatic it was. I'd be interested in hearing people's views, both for and against. Earlier this week Messianic leaders issued a joint statement responding to the forthcoming Christ at the Checkpoint conference. The statement is available here. (I mentioned this briefly in an earlier post), while the Messianic RPP site commented on it here. Later this week the organisers of Christ at the Checkpoint issued a response to the Messianic statement, which can be found here. Your statement has undermined all these reconciliation efforts, given the wrong impression concerning our relationship with the Messianic body, and done harm to the unity of the body of Christ in the Holy Land. Pastor Youcef Nadarkhani is currently in prison awaiting execution in Iran for converting from Islam to Christianity. Christian organisations, individuals and national politicians in various countries have been lobbying hard for Nadarkhani's release. However, reports have surfaced in the last day indicating his sentence has been confirmed and he could now be executed at any moment. Christian lobby groups are urging everyone to act now to put Iran under intense pressure to stop this from happening. For advice on how to get involved visit the Christian Solidarity Worldwide website. In the meantime it is essential for Christians everywhere to pray for Pastor Nadarkhani, together with his young family, during this desperate time. Towards the end of last week four leading Messianic organisations in the US issued a joint statement in response to the forthcoming Christ at the Checkpoint 2 conference (hat tip RPP). The full statement is available here. This represents a significant statement for several reasons. First, it is measured and statesman-like, yet raises a number of valid concerns about CatC2. Secondly as a joint statement by several leading Messianic organisations, it represents an important expression of the views of Jewish believers in Jesus towards the conference. Third, the statement has been picked up by various major news outlets, as well as being supported by the wider Church. One would hope and pray that the CatC organisers will at the very least engage seriously with and respond to such an important statement (as they have on their blog to other criticisms which they clearly do not take seriously). After all, this joint statement marks a significant expression of genuine Messianic concern about the CatC event, Neither can it simply be dismissed by drawing attention to how several Messianic individuals will be attending the conference. Somehow much of the Messianic movement remains unconvinced of the aims and purpose of the conference, and if CatC indeed really is about seeking reconciliation, then surely the organisers must respond to the joint statement by the UMJC, MJAA, IMJA and IAMC. On several occasions this blog has suggested the Palestinians have had somewhat of a raw deal. Yet much of the blame lies firmly with the Palestinians' leaders (see my comments here, here and here). Thus the Israel-bashers harm their own cause by ignoring how many of the Palestinian leaders, inept and often driven by hatred, are themselves responsible for a great deal of the situation the wider Palestinian people find themselves in. I'm reminded of the aid industry to Africa which, by ignoring systemic abuse whereby elites cream off the top, has resulted in the poorest parts of the continent remaining aid-dependent for decades. Ignoring one aspect of a situation merely compounds the problem. Part of the problem is that Palestinian leaders keep saying no. They've said it regardless of the deal on offer since early in the twentieth century. Is this because these leaders are driven by unrealism, a desire for all the land, or perhaps an inability to approach the issue pragmatically? In an interesting article exploring the long history of Palestinians saying no proposed divisions of the land, Jack Schwartzwald believes that Palestinian leaders have been driven by an ideology which seeks to eradicate any Jewish national expression in Judaism's ancestral homeland. But, he argues, this is systematic of a wider Islamist intolerance towards non-Muslims across the Middle East. It's an interesting article, well worth a read, and can be found here. These sins are like black velvet which makes the diamonds of new developments stand out more brightly. What I will be writing here will have little or no effect upon those for whom the Roman Catholic Church (RCC) must remain a stigmatized group and negative category. Yet what readers need to be aware of is that Dauermann has just concluded another series exploring Lausanne and the World Council of Churches' view of the Jewish people. Thus he juxtaposes a Catholic thawing towards the Jews with Protestantism's hardening of its position against them. So whatever your views on Catholicism, be sure to read what Dauermann is actually saying (rather than what some might think he is saying). It can be found on his website and part 3 is yet to be published. Incidentally, some months ago I came across an interesting website by a group with the name Catholics for Israel. You can't read this page and then continue to bunch all Catholics together as anti-Israel. Some of the resources on this page demonstrate quite the opposite. Have finally taken the plunge and become a tweeter (or twitterer). Note the Twitter feed to the right of the page. No meaningless, boring or needlessly frivolous tweets, I promise. Rather, I plan to use it to draw attention to and comment briefly on all sorts of interesting stuff I come across relating to this blog's focus (so often I read something really valuable and plan to comment, but in the end time simply doesn't permit, but this looks like the solution). So keep track of my tweets with the new feed gadget on this page, or better, why not follow me @smith_calvin? My feed automatically lets followers know when I post something new on this blog (in the next couple of weeks I'll be posting on what the Israel is which Gentile Christians are grafted on to, Romans 11:17-24, as well as the claim/current debate surrounding whether the Palestinians are the original ethnic inhabitants of the land, which you don't want to miss). Oh, and I've now added social network buttons after each post so they can be shared more easily. From long experience, the Church knows how to deal with Jewish weakness, neediness, and suffering: it does not know how to deal with Jewish strength. The Church has learned to deal with Jewish impotence, but not Jewish virility. Apart from keeping these things in mind, analyses of the root of Christian concern about “the sins of the Jewish State” will always be flawed. On his blog Olivier Melnick has a piece on how "Christian Palestinianism" contributes to the demonisation and thus delegitimisation of Israel. But this wider political effect aside, I was interested in Melnich's comment highlighting how Christian Palestinianism strips Christianity of its Jewish roots and seeks to de-Judaise Jesus and the Christian faith, creating a kind of modern-day Marcionism (a second century heresy which similarly relegated, better, ditched, the God and scriptures of the Old Testament). Of course, an academic focus in recent years on the Jewish roots of the Church, 1st century Jewish-Christian hermeneutics, and the religious and cultural milieu of New Testament Christianity all demonstrate unequivocally the thoroughly Jewish origin and nature of early Christianity and how de-Judaising Christianity is pure folly. Neither is focusing on the Jewish roots of the faith the exclusive domain of nonsupersessionism, as important contributions in this field by, for example, N.T. Wright demonstrate. So recognising, appreciating and exploring the Jewish roots of Christianity does not necessarily translate into holding a nonsupersessionist view. 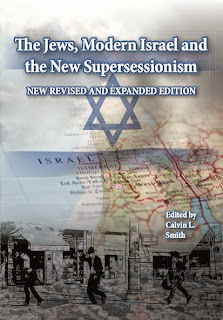 At this stage I think it might be helpful to step back for a moment and clarify some of the terminology which is bandied about, which unfortunately is not helped by how some of the new supersessionist authors present Christian Zionism (CZ) as a monolithic and extremist bloc. I suppose, at its most basic, we could say that just as CZ champions the Jewish people and is generally sympathetic to the modern State of Israel, so Christian Palestinianism (CP) champions the Arab people and supports the creation of a Palestinian state. Beyond this, the current polarised debate makes it is difficult to define either term more satisfactorily without being polemical or pejorative. But perhaps the way around this impasse is to define CP in exactly the same manner as Christian Palestinianists define CZ (a kind of mirror image, if you will). Thus just as some CPs define CZs as extremists, racists, condoning Israeli state terrorism and repudiating the Gospel, conversely extremist CPs are similarly anti-Semitic, turn a blind eye to Islamic terrorism and are pro-Islam. Alternatively, while some CZs support Israel but struggle with aspects of Israeli policy, likewise some CPs may support the Arab people but struggle with aspects of Hamas and Fatah. If you think about it this twin system of defining CP and CZ works rather well, allowing for moderate and extreme expressions on both sides. At the vey least it will certainly help to challenge the stereotype of CZ as somehow monolithic and extremist (the proviso being, of course, that there are also moderate expressions of CP). To confuse the issue further, at this stage we should also mention Christian anti-Zionism. Whereas CP is defined by who it sides with (the Palestinians), Christian anti-Zionism, as the name suggests, is defined first and foremost by what it opposes. Thus theoretically Christian anti-Zionism need not imply wholesale, uncritical (or indeed any) support for the Palestinians, Palestinian Authority or a Palestinian state. Primarily Christian anti-Zionism is concerned with theologically challenging Christian Zionism. Thus the theological shift is away from either peoples in the Middle East (Arabs and Jews) to a theological debate and challenging the views of a segment of Christians within the wider church. At the risk of complicating the matter yet further, it is also essential to differentiate between Christian Palestinianism and Palestinian Christianity. Like Christian Zionism, the former represents a bloc within wider Christianity which support and champions one of the peoples of the Middle East, whereas Palestinian Christianity represents an exclusively Arab expression of Christianity among the Palestinian people. Hence, Palestinian Christianity consists of Palestinian Anglicans, Baptists, Charismatics, Orthodox, Catholic, and so on, some of which are Evangelicals, others not. In any debate exploring a complex issues, such as the Middle East conflict, it is essential not to generalise and oversimplify, always seeking to bring sophistication and nuance to the issue. This is why carefully defining terminology represents such an essential first step in any academic treatment of an issue. Thus it is important to recognise the technical and theoretical differences between Christian Palestinianism, Christian anti-Zionism and Palestinian Christianity. Utilising this terminology begins to help one see the different agendas and approaches of all three camps, allowing one to craft a separate and tailored response to each. Christian Palestinianism is well on its way to de-judaize Jesus – a job that the gentile branch of Christianity generously contributed to, out of ignorance or pure hatred of the Jews over the centuries. CP will also continue to invalidate much of the Jewish Scriptures as history gets re-written and Jewish references get replaced to accommodate the “Islamization” of the Bible. At a time when those Christians who believe God retains a plan and purpose for the Jewish people (including those who believe He has restored them to the land) are increasingly eschewing the extremes of Christian Zionism and seek to be more nuanced in their theological and political treatment of the issues, it is equally fitting and appropriate for our Christian brothers on the other side of the debate to challenge the relegation of the Old Testament and the Jewish roots, reprimanding and resisting any form of modern day Marcionism. The Jewish roots of the Christian faith is a given, a fact of life which supersessionist and nonsupersessionist scholars alike agree upon, and therefore any version of pro-Palestinian Christianity which denies the Jewish roots of Christianity arguably gives the dangerous impression of seeking to expunge Jews and Jewishness from Christianity. Currently in (a rather cold) Luxembourg City for a weekend with my wonderful wife. Having spent various fleeting visits here over the last twenty or so years - usually passing through during my many relief trips to Eastern Europe as the Iron Curtain came down - this is one of those rather unusual European places I rather like. Part of the fascination is the nature of this tiny principality... I've always been fascinated with such places, for example Andorra, Monaco, Gibraltar and Liechtenstein. Recently, though, I've become aware of the small Jewish presence here, which is nonetheless important for several reasons despite its tiny size. So I just wondered, apart from the standard Wiki and general web info, can anyone recommend me some decent sources on Luxembourger Jewry. Would also be interested to learn if there is a Messianic movement of sorts here. Thanks.